Swing Fashion - Men's Shoes - Swing It! Shoes! Oh, Man. Shoes. Such a glorious topic when it comes to dancing. What sole is good? What shoe looks good? What is the “right” shoe? I honestly think, when it comes to Swing, there’s no “right” shoe, there just isn’t. There’s certainly preferred shoes and preferred soles but, in the end, it’s all about preference. With this in mind, Fellas, I’m going to tell you all about the shoes I’ve trialled, the ones I prefer and why. Chuck Taylor knew where it was at…sort of. 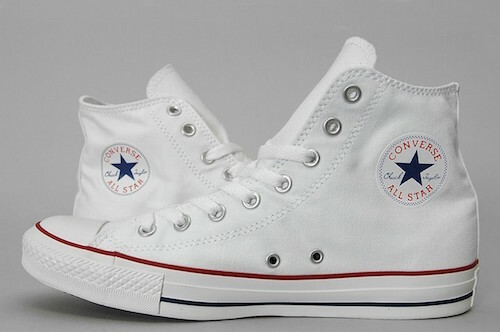 My first pair of “Swing” shoes was a, then, perfectly crisp pair of white Converse boots, “Chucks”. My reasoning was A) They were my shoe of choice back then and B) they were legitimate vintage style sneakers. HOW COULD YOU GET MORE AUTHENTIC?! They quickly became battered and covered in dust and dirt but I loved them to death. In fact, well after they’d been retired, I broke them out and wore them when I competed in Hellzapoppin’. The question is, of course, were they a good dance shoe? My answer is, no. The problem I had with Chucks is, firstly, they have no cushioning, you’re basically dancing on cardboard and rubber. The other problem I have is the rubber on Cons tends to be stickier than other rubber soled shoes. Because of that, whenever I spun or pivoted there was friction that my body and joints had to deal with. Sometimes you need a bit of stick and that means wearing rubber soled shoes but, for me, Cons weren’t the way to go. 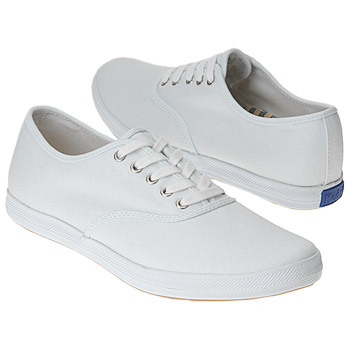 One of the shoes that worked when it came to not too much grip but enough for traction on slick floors was Keds. In a previous post I pointed out these are often the shoe of choice for ladies and there’s certainly a fair amount of guys that wear them too (like me!). I like my Keds, they’re light and not too grippy. When it comes to sneakers, this is my personal shoe of choice for years. I grew up as a skater so, when the Cons weren’t working for me, my first instinct was to go back to the shoe I grew up with…Vans. I love dancing in my Vans if it’s going to be a long night and I need some cushioning…they can be sticky though. More importantly however I love TEACHING in my Vans. First and foremost…CUSHIONING. My goodness, so much cushioning. I can teach all day (and often have) and my feet are still super snuggy in my Vans. They have a good, flat sole so you get even traction on the floor and the rubber isn’t too grippy. My personal preference is the slip ons because, seriously, laces…why?! They can feel a little blocky for some and potentially too heavy but I love them. Not to mention they look pretty darn cool and their range of colours means you can matchy match to your heart’s content. It’s like Gene Kelly meets Tony Hawke (there’s a sentence I never thought I’d see). In the end though, there’s one shoe I absolutely swear by and wear all the time on the dance floor and that’s my Stacey Adams. I actually bought my first pair of Staceys in, wow, 2000 I think. I popped in to an old shoe store in San Diego and bought a horrid looking two tone pair but BOY did I love the hell out of them…and BOY could I not dance in them to save my life. Dancing on leather soles can be tricky when you’re just starting out. Rubber makes things a lot easier and leather is just unforgiving as hell; if your balance is off or you’re on the wrong part of your foot, yep, you’re going down (or at the very least looking like a drunk ice skater). However if you persevere, leather soles are just the best. Good traction, wonderful for spinning and a good sound for variations. Of course they won’t work with every floor but when they do, wow. Staceys come in a wide range of styles and colours. 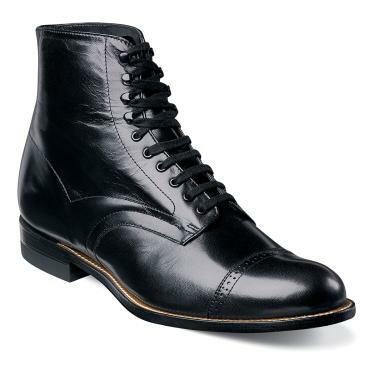 My personal preference is the Madison and, more specifically, the Madison boot. The boots aren’t for everyone though. Stacey Adams are also hard to get in Australia so you’ll need to look online for US sites that ship overseas. In the end there’s no one shoe that will work on every single floor and because of this I take two pairs to every dance event. I turn up in rubber soles with my leathers in my bag or vice versa. I’ve never been a fan of tape. I know it’s often the go to for sticky shoes but it messes up your sole with sticky rubbish, picks up gunk from the floor and marks your shoes. For me it’s far easier to have two pairs ready to go, slicks and stickies.